All things pumpkin are slowly creeping back into the stores and it’s still only September! The pumpkin theme is an easy theme to integrate into your classroom because of the flexibility that it offers. 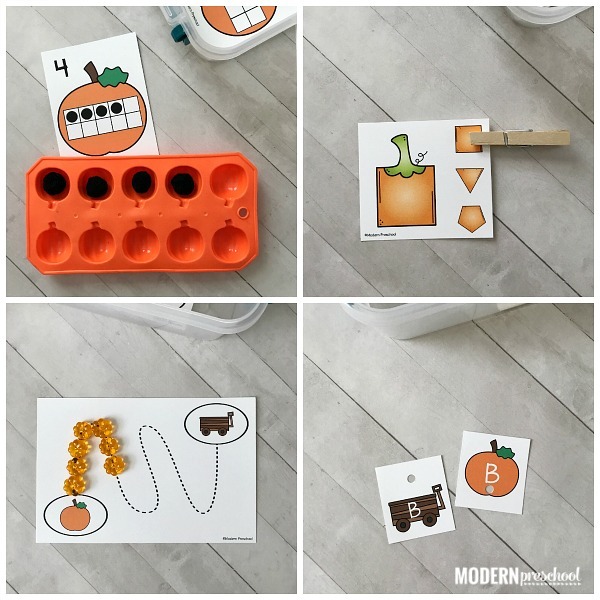 Printable activities like our pumpkin patch counting cards can easily be used with whatever manipulatives you have on hand that are orange and round. And that best part is that this fine motor math activity can be reused and stored as a busy bin or busy bag! The set of free printable pumpkin patch counting cards include numbers 1-12. To prep the activity, simply print the file from the pink button below. 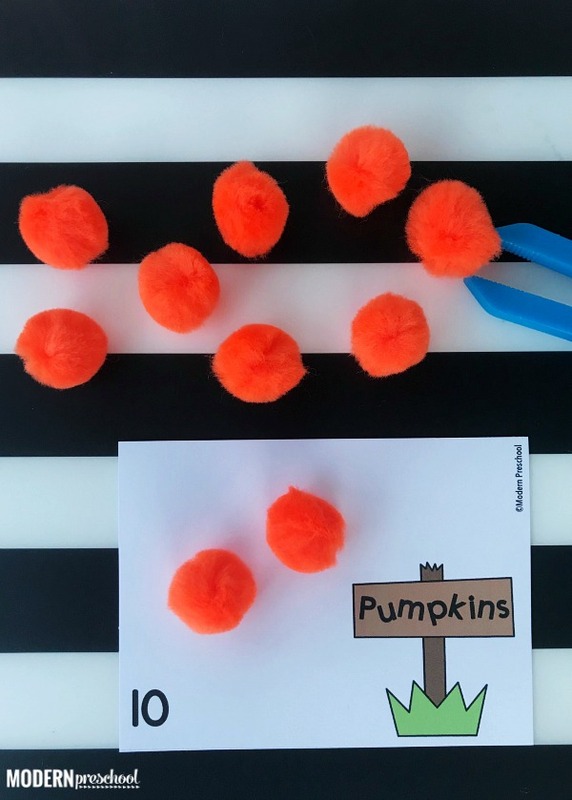 Cut the pumpkin patch cards apart and then laminate the set for added durability. Add the counting cards to a basket or tray. Find small pumpkin manipulatives, toys, mini erasers, or orange play dough to use as pumpkins in your pumpkin patch. Now it’s time to play and learn! 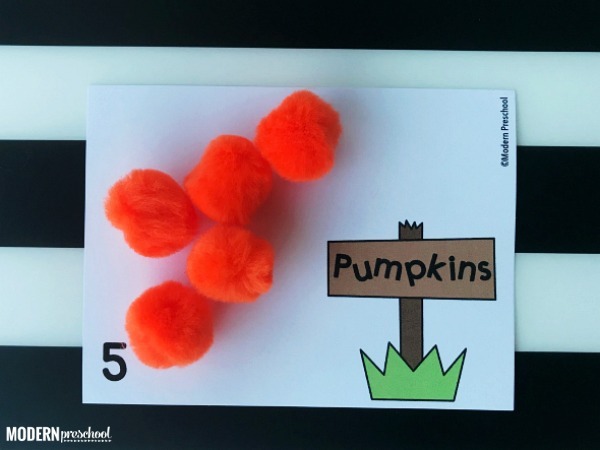 Initially, we used orange pom poms for the pumpkins in our pumpkin patch counting cards. I added a handful of pom poms to the tray. For extra fine motor practice, I also added a set of kid-friendly squeezers to the math activity. Squeezing and letting go pom poms is simple enough for younger preschoolers, but repetitive reminders may still be needed. In my preschool classroom, you will hear me say, “squeeze and let go, squeeze and let go,” over and over so to help make new activities successful and less frustrating. Identify the number on the pumpkin patch card. Count out the same number of pom poms from the pile. 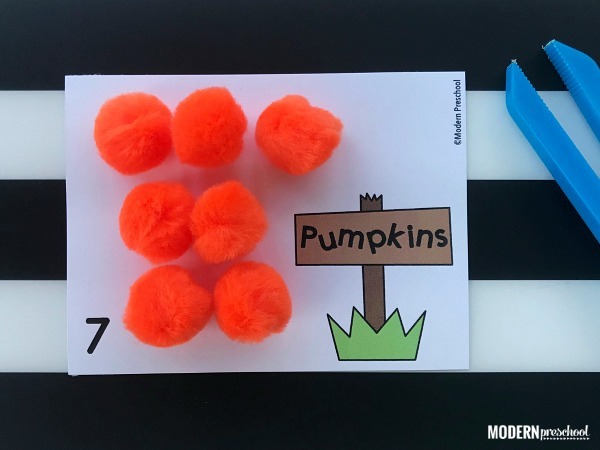 Use the kid-friendly squeezers to add one of the pom poms to the counting cards at a time, while counting each one. Stop at the number on the card. For an added challenge, count backwards when taking the pom poms off of the card to clear it! 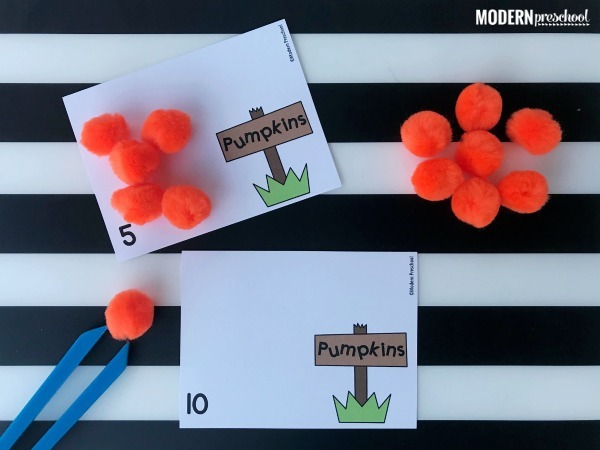 If you have been playing with orange pom poms on the pumpkin patch counting cards, and need to change it up to keep your preschooler engaged, there are other ways to play! Add orange play dough to the counting cards. Pinch a piece of play dough and roll it into a ball on the table to make a pumpkin. Make enough pumpkins to correctly fill the pumpkin patch and then pick a new card. If the pumpkin patch counting cards are laminated, use dry erase markers to draw pumpkins on the pumpkin patch cards. Circles are easier shapes for little hands to draw. Encourage your preschooler to count while drawing each pumpkin. No matter how you use these cards, lots of preschool skills are being practiced! I am a huge fan of adding fine motor skills into learning activities in my classroom. 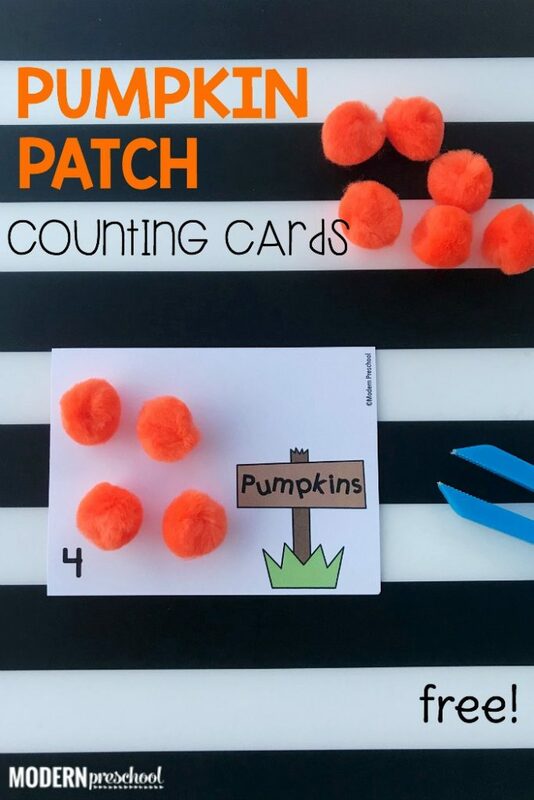 Our pumpkin patch counting cards would be the perfect addition to our Pumpkin Fine Motor Busy Bins. 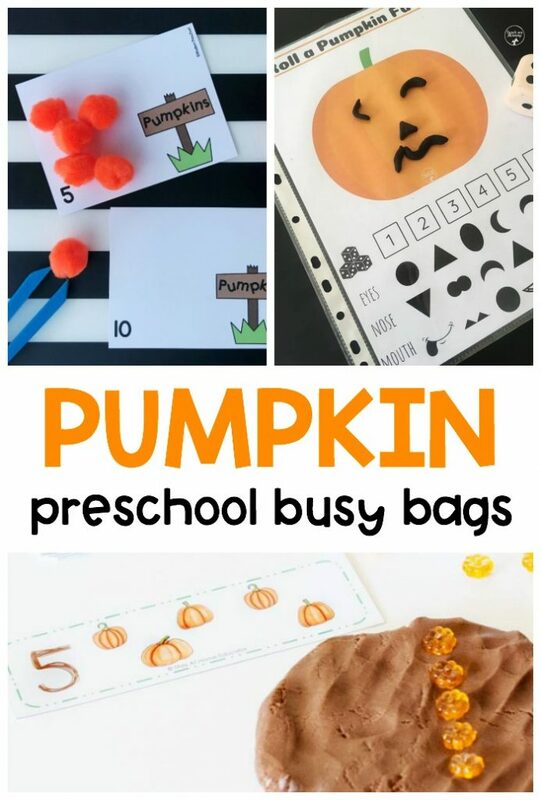 For even more pumpkin themed ideas that can be used again and again, check out the preschool busy bags below!